"The Bambergers never sound hurried, even at the fast tempo they adopt for the scherzo fifth movement, and the recording, if a trifle on the ‘warm’ side, sounds well in this transfer. " "You’re not likely to find a better performance than that given by Erich Leinsdorf with the Concert Arts Symphony Orchestra in stereo in 1958 and the recording still sounds first rate. " "It’s still well worth hearing though we’re used to hearing it played less majestically and at a rather faster tempo these days"
"There are more modern versions of this bold and attractive music, some of the first to feature instruments in their own right rather than accompanying the voice, but these Mercury recordings, grand and unhurried, are rather special and it’s good to have them available again, not just as historical curiosities or as demonstrating the range of Fennell’s musical interests – like Gendron’s Haydn they’re more valuable than that in their own right. If you’re new to this repertoire and wonder where to start, the sonata pian’e forte is the best known of these pieces. " "Felix Slatkin conducts his ‘other’ orchestra, the Hollywood Bowl Symphony, in a snappy performance of George Gershwin’s An American in Paris, recorded in stereo in 1959. I’ve heard more raucous car horns in this work, but that’s my only (small) grumble. The sound may be a trifle thinner than more recent recordings, but you’d hardly notice." "My personal favourite of Beulah’s reissues this month is the performance of Joseph Haydn’s (1732-1809) Cello Concerto in D, with Maurice Gendron (cello) and the Lamoureux Orchestra conducted by Pablo Casals. Not the least of the virtues of this recording is the fact that a veteran cellist conducted the orchestra. The recording, in stereo from 1960, has come up sounding very well in this transfer." "The performance is one of the best ever set down and the recording still sounds fine, even if it doesn’t open out quite as spaciously as more modern versions. " "I don’t recall Victoria de los Angeles and Dietrich Fischer-Dieskau recording much together but they make a fine-sounding combination with Gerald Moore at the piano in Henry Purcell’s Duets, Let us wander and Lost is my quiet – recorded in stereo in 1961 and still sounding well. " "The performance from Erich Leinsdorf with Felix Slatkin’s foundation, the Concert Arts orchestra is about as good as it gets. The sound, though canned as long ago as 1958 (stereo) is first-rate"
Among the Christmas choral blockbusters, L’Enfance du Christ is something of an orphan by comparison with Handel’s Messiah and Bach’s Christmas Oratorio, apart from the ubiquitous Shepherds’ farewell. To be honest, I can’t remember when I last chose to listen to it – and this reissue reminds me what I’ve been missing. 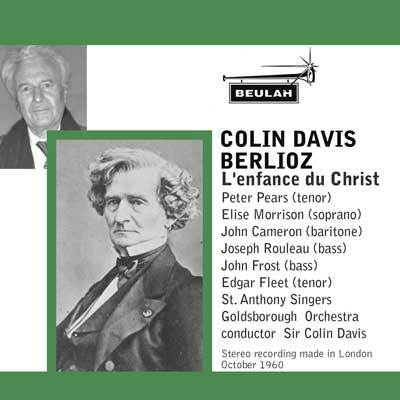 This is the first Colin Davis recording, made in 1960 for the Oiseau-Lyre label, not his later Philips remake or his even more recent version for the LSO’s own label. With that LSO Live version apparently the only one currently available in the UK, this Beulah reissue of Mark 1 is very welcome. On its first appearance Alec Robertson wrote ‘There is no need for any critical hesitation here. This performance of L’Enfance du Christ has all the qualities that I have for years dreamt of and longed for’ and that remains true. I’m not a great fan of the timbre of Peter Pears but his performance as narrator has not been bettered and the other soloists can all hold their own, even with the incomparable Dame Janet Baker as Mary on the Philips recording as against Elsie Morison here, singing low in her register. Joseph Rouleau as Herod, singing of the hardships of being a king (Toujours ce rêve … Ô misère des rois) offers a particularly strong argument for this early recording. In this transfer the recording holds its own as well as the performance does. There’s no libretto, but that’s easy to come by, for example at berlioz.com. The Solesmes choir under Dom Joseph Gajard were trend-setters in the editing and performing of plainchant, with recordings from the 1930s onwards. These performances of the first and third masses of the Nativity appeared in 1956 on Decca LXT5251 to a warm welcome. The recording, too, was very good for its time, albeit in mono only. Though there have been other recordings since which aim at reproducing the authentic sound of plainsong at a particular period of history – it has been something of a moveable feast – it was Solesmes who established the modern norm and these reissues of their singing the Christmas Masses make recommendable reissues.